It is football day again, and my 16 year old daughter (Nerys) plays in the Woman's reserves for the West Auckland Football Association. As the game was a home game we went on our bikes to the field. She rides an Aprilia STX-150, which in other parts of the world is branded as a Derbi or Zanellas. After the game Nerys wanted to have a slightly longer ride home and as she has only been riding since about Feb of this year I led, taking it easy for her. 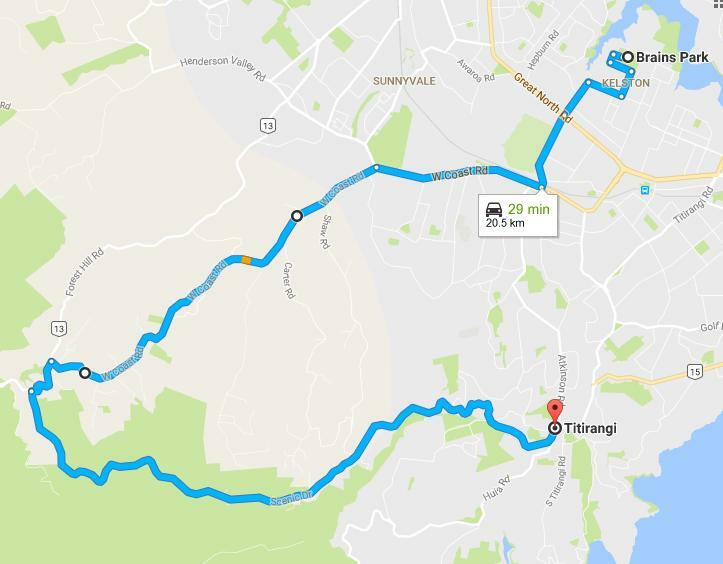 I was on my new Yamaha MT-03 and led her to Oratia and up to Scenic Drive then back to Titirangi. 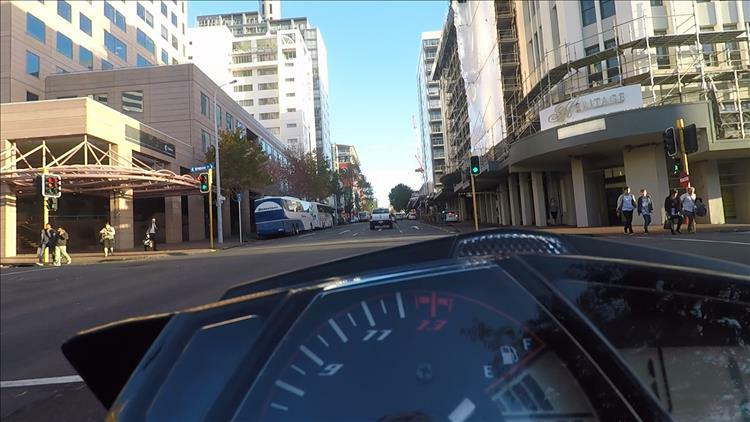 I was not pushing the MT-03, just taking it easy and find around town at 50km/hr it will happily sit in 5th at about 3,500 revs. The engine doesn't like pulling too much below 3k but other than that it just putts along happily. When I am turning in to a street 3rd works as well, I don't even have to drop to 2nd. Even around some of the very tight corners I only got down to 2nd and with a gentle twist the bike calmly pulls out of the corner. 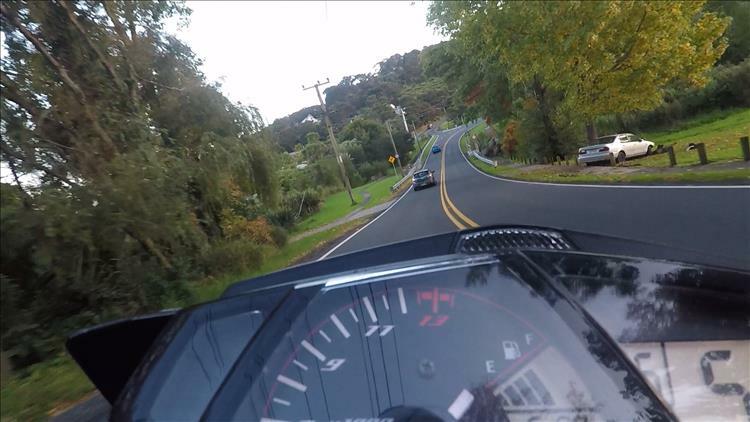 The gear box is very smooth and the brakes slow down the bike nicely, having the ABS as standard sure doesn't hurt. The fuel economy, from the average meter which I reset when we left home, was 24.5km/l, or about 70mpg. Tuesday will be my first ride to work on the bike in rush hour traffic as well so it will interesting to see how that goes. We're always looking for guest posts as they bring fresh perspectives and information to our website. If you'd like to contribute please Click Here. Wow. Blue sky, sunshine and empty roads and stunning scenery. Very nice. I makes me sick with envy Keith m. I'm sure life is far from perfect in New Zealand but then you learn it's a country similar in size to GB with less than 5 million residents. I figure there's a bit of space to breathe. The downside is getting to the nearest foreign land involves a lot more than a 30 minute train through a tunnel. At least they drive on the correct side of the road. The way the weather is here, is on the Sunday for the game, it was a lovely, warm autumn day. Friday it was pouring down, and my gloves have taken 3 days to dry out, in front of the fireplace. There is a song by a NZ group called "4 Seasons in One day" by Crowded House. It is a very fitting title for the type of weather we get here, esp in Auckland where we can stand on a hill and see 2 seas. And yes I am also thankful we drive on the correct side of the road as well. As for the camera, I have gone for a GoPro Hero 5 in the end, as I can swap batteries, and it is also waterproof to 10m without a separate housing. It also contains a GPS as well, and you can add on speed, direction etc on to the movie as well. With that I have found that the Yamaha over reads by about 10%. Your weather reminds me of here. We've had an unusually long dry spell here although it's not been warm. These last few days normal service has been resumed with heavy showers and everyone is now appropriately depressed and subdued just as it should be in Blighty. We know Crowded House here and we know the 4 seasons in one day song. I didn't know they were from NZ though. 10% - seems typical these days for most modern speedometers. If accuracy is important I know there are plug in speed correctors for the CB500X so there's likely to be one for the MT03 soon enough. To give everyone an idea of what it can be like here..
That was in the morning and this is on the same day in the afternoon. 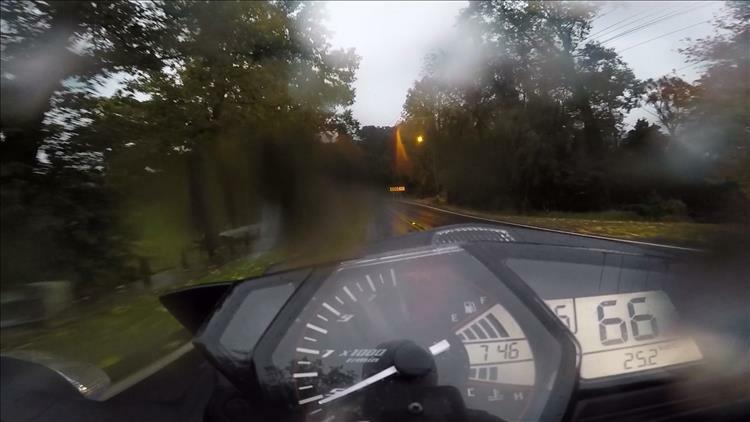 And some people just don't seem to be able to deal with a little wet and bends. The car was there in the morning as well, but the water on the lens meant it was too hard to see. Sounds rather like the UK weatherwise Fran. "If you don't like the weather here...just wait a while." We don't get much in the way of earthquakes though, they have started fracking in Blackpool some 30 miles north of my home so that could all change soon.